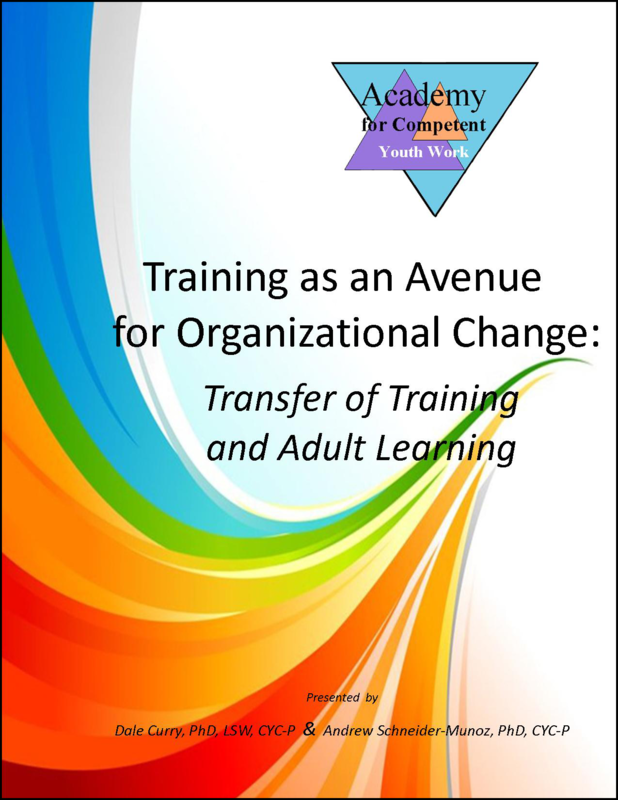 Human services research shows that the effectiveness of staff training can be significantly increased when implemented as part of an overall organizational change effort. Helping supervisors and managers develop plans for supporting staff learning before, during, and following training is key to increasing the impact of training on organization services and outcomes. This training will help organization leaders implement a basic yet comprehensive model to support staff learning and behavior change. Practical transfer strategies, based on research evidence, will be explored. Multi-modal training strategies including the use of a case study and several experiential exercises will be used to examine skill development and the transfer of learning processes. Participants will apply transfer of learning principles and develop a plan to support the implementation of the CYC: Foundations Course and CYC Certification as part of an organizational change strategy. Examine a basic yet comprehensive model of transfer assessment and intervention. Explore factors that help or hinder transfer of learning. Develop plans to increase the impact of the CYC: Foundation Course and CYC certification as part of an organizational change strategy. This training is offered as a one day training that includes 6.5 credit hours with an hour lunch break. Course participants receive a course manual. These classes are designed to accommodate up to 50 participants. Typically classes contain between 10 and 40 participants.